Sign up and receive Property Email Alerts of Houses for sale in Mooiplaats, Pretoria East. 4 Bedroom, 2 bathroom house, 8.5 ha land with seperate office and cottage. Neat Face-brick, approximate 275 sqm house with 4x bedroom, 2x bathrooms, study, double garage, small workshop/toolshed on 8,5 ha farm land. Situated 7 km from Lynnwood road and turnoff from tar road R631 route, you are still near town and all necessary amenities. Enjoy this small farm with separate 180 sqm office containing 1x bedroom bachelor flat adjacent, plus separate 1x bedroom rondavel with living area cottage, a shed and 2 worker accommodation with electricity. Tshwane single phase electricity, equipped borehole, fenced. 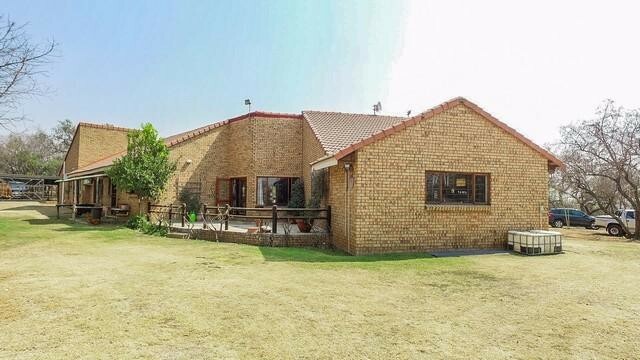 8,5 ha farm with 4 bedroom house, separate offices, bachelor flat and cottage in Pretoria East near Waterlake Farm Eco estate. Sign-up and receive Property Email Alerts of Houses for sale in Mooiplaats, Pretoria East.